I'm just sharing some basic tips about communication today that are often forgotten. These are very basic, and if we do not currently practice them, we should work on making them a habit so that we may have that "meek and quiet spirit" that is of great worth to the Lord. When someone is speaking to you, listen. Really listen. Be attentive. Don't think about whatever else is going on around you, or what you should say in reply while someone is telling you about something. Just be quiet and listen. If you don't quite understand what is being said, or if you would like further information, ask questions. This is to be done politely, of course, and with a goal of having better understanding. It is much better to ask questions than to make assumptions about someone or something. There are so many times that people have made assumptions about me instead of taking the time to get to know me or asking questions to find out what is really going on in my life or what I think about something. Making assumptions can be terribly destructive. 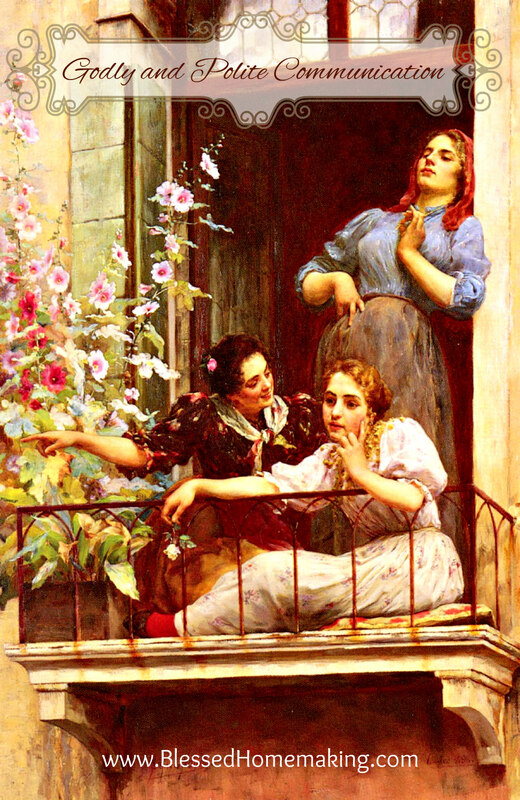 Many times, gossip is made based on assumptions someone has made about someone else, or it may be a deliberate spreading of falsehood if someone is really malicious. We should get in the habit of not passing on, or listening to, unseemly news or information about others, but instead go to the source, if need be, to find out the truth. The Bible has much to say against slander and gossip. I will leave off with this verse, and encourage you to be reading God's wonderful Word every day, as it has much to teach us about communication (as well as everything else that pertains to life and godliness). Thank you for sharing this post and especially the verse to go with it. It really is too easy to either overlook people or to assume things about them without getting to know them and understand their heart. Everyone has good qualities and some things that are difficult. It really does help if we will just take the time to try to listen with our hearts and pray for others. Thank you so much for a wonderful reminder! Yes, truly listening and also praying for others is important, as well as speaking truth in a loving way when it is time. You are very welcome, Mrs. Dave.